It always fascinates me how people can put their trash cans out the evening before pick up and have open lids with obvious food containers sticking out of them. Every time I see this I tell my husband, “raccoons will be very happy tonight.” Then the next morning you see the garbage can tipped over with garbage spewed all over the ground. You would think that these people would know better. That one was obvious but there are other reasons why unwelcome raccoons might come around. If you want to keep raccoons out of your yard then read on….. I know that they are cute animals especially when they are young but they can be your worst nightmare if they are hanging around your house every night. There is a reason for raccoons coming around and if you know why then you can take actions to nip it in the bud. That is unless you don’t mind them. Raccoons have a strong sense of smell and will eat just about anything that they can get their paws on. They will eat dog food, human food, birds and bird eggs, berries, nuts, corn, plants, worms, beetles, crayfish, small snakes, mice, and garden vegetables just to name a few. They are not picky eaters. So obviously one way to keep raccoons out of your yard is to take care of your garbage cans. Either keep them in your garage until garbage day or put a bungee cord or place something heavy on top of them to keep raccoons from being able to open them. We have industrial size trash cans that weren’t cheap but seem to keep raccoons away as we have never had a problem with them. A lot of times you can either rent them or have them supplied by your trash collection company. Another way is to make sure to put any pet food containers indoors including water bowls every night. Raccoons need water too! Bird feeders are another attraction for raccoons. They will gladly eat all of the seed in one sitting. Our feeders are on a sturdy pole that has a squirrel baffle on it. Raccoons have a difficult time climbing it and we have never had any problems with squirrels or raccoons. 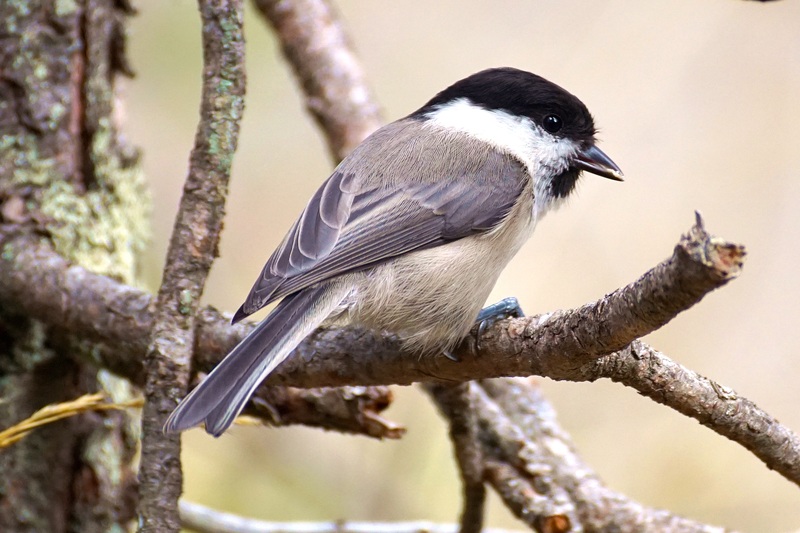 Or place your feeders in a spot where raccoons cannot climb to get to it such as on a hook attached to your siding or patio roof. If you have a decorative garden koi pond in your yard, watch out for raccoons coming in to gobble up the fish. Those fish are good eating for raccoons. However, if you keep the fish in deeper water (2 ft. or deeper) the raccoons will not touch them as they do not like being submerged in it. Just make sure that water’s edge instantly drops and is not a gradual decline. Always make sure to clean up after yourself before turning inside for the night. 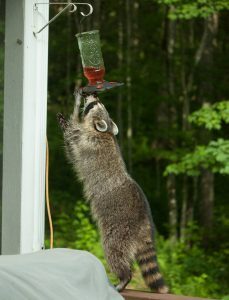 Don’t leave your drink cups or food bags out on your deck as this will definitely attract raccoons in. Be sure to keep your garage or shed door closed as raccoons may decide to hunker in for the night or worse make their dens (up to 6 babies) in there. Keep in mind that an adult raccoon can squeeze through a four inch opening. Install a chimney cap on your chimney to keep raccoons out. They love chimneys for their dens because it is just like a tree hollow to them. Put fencing around your vegetable garden and use scarecrows, hanging aluminum pie pans, or windmills to deter them. This works for a while. Some people spray a mixture of equal parts ground garlic and chili powder or cayenne pepper around the perimeter as raccoons do not like the taste. However, this is not a one time fix because if it rains you will have to spray again. If you already have a problem with raccoons, there are motion activated lights with sound that you can purchase that some people use that helps keep them away. A last resort and probably your best bet if raccoons are a problem is to call a critter removal company. They should be certified wildlife specialists who are legally aloud to remove and dispose of problem animals. Some people try to trap raccoons themselves and take them elsewhere but it is not legal in most areas. Always check with your local laws. Raccoons are nocturnal animals that work at night to get their food. However, sometimes they hunt during the day to get their business done especially during birthing season which is usually in the spring. Breeding season is in later winter with the female gestation period of about 65 days. Raccoons do not make their own dens but will use hollowed out trees, forks in trees, hollow logs, and old squirrel nests to name a few. They will also use sheds, garages, basements, chimneys, barns, or whatever works for them. A female raccoon usually gives birth to one litter per year. A litter may be three to five babies. Families stay together (mama and litter) up to one year after birth. 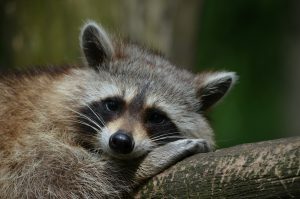 Raccoons communicate using up to 200 different sounds including growling, snarling and hissing. Rabid raccoons exhibit unusual behaviors such as being disoriented, confused, slow, or unexplained aggression. Most people assume that if they see a raccoon during the daytime it must be rabid. However, as mentioned in the first fact, sometimes they are just out finding food. Raccoons have great dexterity. They can open bottles, jars, latches, and doors. They are great climbers and have the amazing ability of falling and landing on their feet. They can fall up to 40 feet without injury. I have seen this happen at my old house. A raccoon fell about 15 feet from our deck that had an open platform birdfeeder where it was eating, landed on its feet, then took off running. Raccoons can run up to 15 miles per hour. 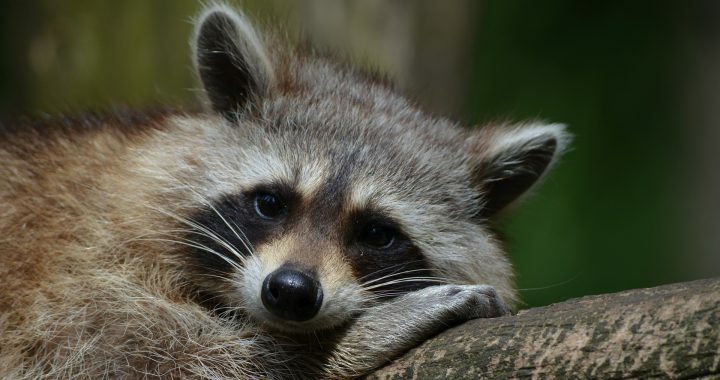 Raccoons can be a menace in your backyard, your house, your garage, your shed, or anything where there is food or a place for it to make a den. There are measures that you can take to avoid problems with them too. It all boils down to keeping your backyard free of food lying around (i.e. 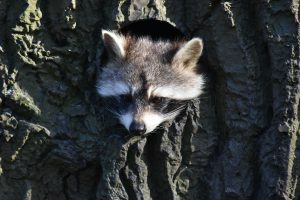 dog or cat food bowls), strategically placing your bird feeders where raccoons cannot get to them, and making sure that you keep your garbage in a place that cannot be accessible to them. Also, make sure to keep access to your house or other buildings closed at night if you do not want raccoons coming in. Remember, an adult raccoon can squeeze into a four inch opening. Do you have a raccoon problem? What effective measures do you take to keep them away? Please feel free to make comments below. Posted in Backyard Wildlife, Bird Feeders and tagged keep raccoons away, raccoons.